The formerly Templepatrick-trained Blaklion will be well backed at Aintree tomorrow to complete a notable big-race hat-trick by horses with Ulster links. Blaklion goes in the world's greatest steeplechase, the £1million Aintree Grand National, sponsored by Crumlin-based Randox Health. Connections will be looking to follow on from the success of Native River - bred in Dromore by the Mackay family - which won the Cheltenham Gold Cup, and General Principle, winner of the Irish Grand National, who made a winning debut at Kirkistown point-to-point for Larne trainer Stuart Crawford prior to his sale to Ryanair boss Michael O'Leary. Last year's winner, One For Arthur, started his career in a Crumlin point-to-point while Pineau De Re won the Ulster National in 2013 before victory in the real thing in 2014. Bindaree, Little Polveir, Rhyme 'n' Reason, Red Alligator and Anglo are a few of the locally bred past winners of the National. Blaklion gets the vote to continue the province's successful association with the spectacular. The son of Ascot Gold Cup winner Kayf Tara finished fourth on his points debut in 2013 with dual Northern Region Champion rider, Banbridge based Mark O'Hare aboard, and the locally owned and trained horse also finished third in another point-to-point to One For Arthur. British trainer Nigel Twiston-Davies has been a great supporter of the local points circuit, buying numerous horses. Blaklion has now won nine races and in excess of £400,000 for his connections, including finishing fourth in last year's renewal and showed his well-being and liking for the course and fences when winning the Beecher Chase in December of last year, beating The Last Samuri - runner up to Rule The World in the 2016 running of the race. "He was only beaten eight lengths last year and we will ride him with more restraint this time. 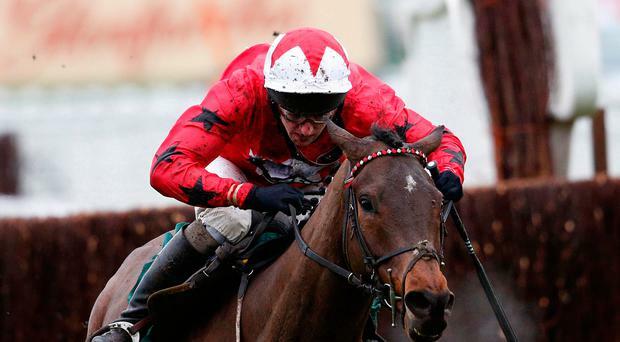 He's gone up 8lb but should be thereabouts," said Twiston-Davies. Double Ross, bred by Down Royal committee member Tom McIlhagga, is another of the Twiston-Davies National team. The trainer said: "He was going well two years ago when the saddle slipped at the Canal Turn." The Last Samuri paid a visit to Down Royal in 2016 to contest the festival feature and was no match for Valseur Lido but is better suited to Aintree and warmed up for the National by finishing third in the Cross Country Chase at the Cheltenham Festival. The Last Samuri has the very important course form to be a major player. Armagh jockey Brian Hughes will partner Seeyouatmidnight, bought a few days ago by David and Patricia Thompson in a bid to repeat the same formula that saw the couple buy Party Politics just days prior victory in 1992. The selection has the benefit of the trainer's son Sam aboard. Anibale Fly has a premier Grade 1 effort to his credit and Barry Geraghty takes the mount. Forecast: 1 Blaklion; 2 Anibale Fly; 3 Seeyouat midknight; 4 Double Ross.